As a film scenarist, writer-director Andrew Bujalski works on a miniature scale, handcrafting his no-budget, semi-improvised dramas of post-collegiate malaise from the barest resources. Pooling friends and acquaintances to handle production duties and act in his 16mm films, and basing his scripts on ideas or anecdotes gleaned from his own social circle, Bujalski has adopted a methodology that belongs to the barebones, do-it-yourself lineage extending from Shadows (John Cassavetes, 1959) to Stranger Than Paradise (Jim Jarmusch, 1984). Even his protagonists – smart, quirky East Coast grads trying to puzzle out their nascent grown-up lives – are threadbare types. Though his efforts, like many small-budget film artists, are decidedly noncommercial (both Woody Allen’s early comedies and the more recent, idiosyncratic work of cine-memoirist Caveh Zahedi come to mind), Bujalski has generated plenty of word-of-mouth buzz, winning an Independent Spirit Award in 2004. Even more impressively, Bujalski has worked a strange kind of white magic on the film-critical establishment, enchanting everyone from Boston University scholar Ray Carney and brainy boomer Amy Taubin to sharp-tongued Gen X critics like Scott Foundas and the even younger Nathan Lee. Owing to the personal nature of Bujalski’s vision and the thoroughly naturalistic performances he drew out of a zero-star-power amateur cast for his long-undistributed 2002 début, Funny Ha Ha, enthusiastic reviewers – when they finally had a chance to see the film – plunked his name down next to revered cinema giants like Cassavetes and Eric Rohmer, spying their influence in the fledgling filmmaker’s modest, quietly affecting effort. 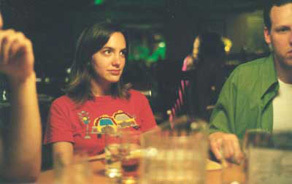 Others noted how Bujalski, with this lone feature, had turned the desultory ethos and irony-drenched conventions of the slacker-era indie rom-com inside out by creating something almost guileless by comparison: a low-key story about the hesitant, sometimes embarrassing efforts of gawky twentysomething Marnie (Kate Dollenmayer) to connect with friends, co-workers and a potential boyfriend. Most critics championed Bujalski’s way of capturing the sweet foibles of youth, citing in particular the vivid manner in which his characters fumble for words as a definitively contemporary tic – a kind of addled iSpeak for the ought generation. Though a few grumblers found his talky, bibulous comedy of manners a bit too slight or æsthetically rough-hewn, no one denied the then-26-year-old Harvard graduate (who wrote, directed, edited and acted in the film) had reinvigorated, with impressive resolve, a nearly obsolete tradition of truly independent feature filmmaking. Watching Funny Ha Ha alongside Mutual Appreciation (2005), his latest micro-drama of youthful indolence and indecision, it’s clear there’s much less torrential emotion and on-screen catharsis than in the canon of Cassavetes (the filmmaker whose name has most often been invoked in reviews), and that Bujalski’s canvas is much leaner and more grounded in a particular place – in this case, the ultra-hip urban ville of Williamsburg, Brooklyn – than any of the younger directors (Jarmusch, Richard Linklater, Noah Baumbach) whose work his sensibility only partly reflects. 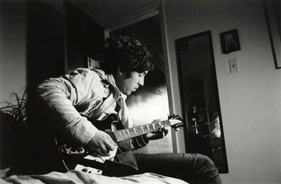 Shot in high-contrast, docu-realistic black and white, Mutual Appreciation is the story of Alan Peoples (Justin Rice), a wayward rock musician newly arrived in New York City after the break-up of his band, The Bumblebees, and a fizzled relationship. Relying on his New York friends, Lawrence (Bujalski), an affable grad-student instructor, and Lawrence’s squeeze Ellie (Rachel Clift) for support and companionship, Alan embarks on his new low-rent, big-city bohemian life with some trepidation and quite a lot of artistic self-absorption. After a fling with college-radio DJ Sara (Seung Min-lee), Alan tries to focus on finding a drummer for his upcoming solo gig at the rock club Northsix (Sara’s brother fits the bill). Things become a bit more tangled for the easygoing trio of friends when Ellie, in an unguarded moment, admits to having a crush on Alan. Though there is more to the story than boozy hook-ups and low-intensity crisis, Bujalski’s ruffled films defy just this kind of tidy synopsis, which is yet another reason Hollywood probably won’t come knocking anytime soon. Certainly, romantic confusion and minor humiliation are the prevailing tropes in Bujalski’s here-and-now observations of youthful, middle-class social manners, but he pulls it off without a hint of pretension. Instead of ironic detachment or knowing nods to subcultural trends (something Bujalski lightly mocks when he has Alan imagine a social-networking tool called The Cool Inclusive Club), his organic films have a strain of tenderness and vulnerability that is too often missing from most putatively “indie” fare, or that’s been twisted beyond recognition by look-at-me cleverness. (Just think of Jonathan Dayton and Valerie Faris’ Little Miss Sunshine from last year, with its emotionally muted idiosyncrasies, or the stridently oddball œuvre of Wes Anderson.) Both Funny Ha Ha and Mutual Appreciation depict a jittery, spatially contained world of tentative friendships and chronic social awkwardness where characters say “I’m sorry” about as often as they fail to finish a thought or end a sentence. And as we eavesdrop on these young people’s incipient lives at parties and in dorm-like bedrooms, in drab offices and other nondescript places, we’re more likely to hear idle yammering about random topics like Buddhism, gardening, iron-deficient diets and the varying styles of modern rock drumming than whiny dialogue about relationship woes. Characters in Bujalski’s films don’t talk at each other, the way they do in Cassavetes’ high-strung, often explosive dramas, and they don’t engage in intellectual repartée, either, like the dramatis personæ of Rohmer’s Moral Tales. They just chat, with the full connotation that word carries in the electronic age, and the effect can be both instant-message mundane and wryly funny. On the other hand, Bujalski also has a keen sense of everything that’s not said in conversation, and how those elisions can provoke subtle shifts in tack and perspective. He is a master, for instance, of the uncomfortable exchange, where tension arises from what’s never articulated: Marnie’s discomfiting sushi-lunch date with lovelorn sad sack Mitchell (Bujalski) in Funny Ha Ha, or Alan and Lawrence’s evasive tête-à-tête over Ellie’s amorous indiscretion in Mutual Appreciation are the most memorable examples of scenes that make you squirm a little bit, then compel you to giggle nervously – but you could sample any sequence from the two films and land on a similar bit of interpersonal frisson. If anything, Bujalski has a knack for dramatizing the endless varieties of passive aggression, devising narrative arcs where no one, in the end, comes off looking unequivocally like a jerk. Whether or not his ragtag sensibility, part film-school nerd and part droll humorist, can survive a bump up to bigger budgets and a broadening of scenaristic space remains to be seen. (Reportedly, the director has just been hired by Notes on a Scandal producer Scott Rudin to adapt Benjamin Kunkel’s debut novel, Indecision, for the big screen.) For now, Bujalski – a former student of Chantal Akerman and sometime substitute teacher in Jamaica Plain, Massachusetts – has two very fine, refreshingly uncalculated features under his belt that attest to his play-it-from-the-hip assurance behind the camera, as well as his impeccable sense of rhythm on the page and in the editing room. I had a chance to speak with Bujalski in mid September shortly before the Manhattan launch party for Mutual Appreciation, which topped many year-end best-of polls for 2006 and was released on DVD in February. Bujalski also appears in the new film Hannah Takes the Stairs by his friend, writer-director Joe Swanberg (Kissing on the Mouth, LOL). Low-key and disarmingly humble, the 29-year-old Boston-based filmmaker talked about how he makes his films, the problems of independent distribution, and his goals for the future. DAMON SMITH: Mutual Appreciation feels to me very much like a follow-up to your first film, Funny Ha Ha, both in terms of the kinds of characters you privilege and the overall æsthetic. What were you trying to build on from your debut? ANDREW BUJALSKI: Certainly the germ of the notion for Mutual was to do a film with Justin Rice in the lead. He’s an old friend and a musician whose band [pop outfit Bishop Allen, who contributed songs to both movies] I like a lot. And that gave me an opportunity to deal with the world of artists in a way that was entirely absent in Funny Ha Ha. Perhaps the most unrealistic thing about Funny was that nobody’s ever talking about art or movies or music. It’s very unrepresentational of people I know. Why did you pick Justin Rice to play the role of Alan Peoples? Was there something about his personality or certain traits you wanted to use to tell a story? The idea of doing a film with Justin came before any story at all. Essentially, this was the same trick I pulled with Funny Ha Ha, where I’d written a screenplay with Kate Dollenmayer in mind to play the lead. Neither of the films are about Kate or Justin, but they definitely build on what I know about their charisma and also what I know about them as performers. Which is a hard thing to explain, because neither of them is an actor. But there’s a way someone will invest themselves in telling an anecdote that gives [you an idea] of how a person performs in their daily life. And so you start to think about what they do that’s funny or what they do that’s compelling, for whatever reason, and how you can take those natural instincts and use it to tell your own story. Do you see a strong connection between your two features? When I had finished making Mutual Appreciation, I felt like I had made a film completely different from the last one. It absolutely depends on where you’re standing in relation to it. If you look at the films next to whatever else is playing at the multiplex right now, obviously they look very similar. If you had been sitting in the editing room with them for a few years, all you see are the differences. A lot of filmmakers have used nonprofessional actors, often spending long periods of time flattening their theatrical tics – Robert Bresson, for instance – or acclimating them to the lights and cameras and crew. How did you manage to do that in 20 days? It has something to do with the fact that many of the actors are my friends. Not everyone in the film is an old friend; some are people who I’d met just shortly before. 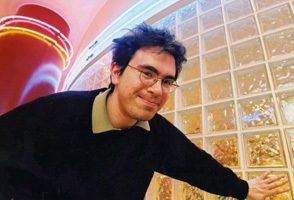 Bill Morrison [director of Decasia, 2002], for instance, who plays Walter [a record-company executive], really grabbed the reins of his part and made it his own in such an inspiring way. Everything we do is based on a kind of personal rapport; it has nothing to do with craft. I’m probably too shy to direct via craft. My ego is easily punctured on set and off set, so it’s really just trying to grapple with it on a really basic and friendly level. People are taking this leap of faith. I try to do screen tests beforehand because everybody reacts differently to the camera and there’s actually no way to predict that until you try it. But we never get fully acclimated to it, and there’s a way in which there are ‘performances’. By no means is everyone just doing what they would naturally do. It has a faux-naturalist feeling, but it is mannered in its own way. It’s just a common likeness that we all stumble on together. Given that you want certain things to happen on camera, and given that the dialogue in a certain sense – even though it’s fresh and seems spontaneous – is stylised, how do you prepare people for a scene? I try to do some rehearsal. With these films, everybody – because they’re nonpros – has a lot of other commitments, so it’s hard. Even if I wanted to do a lot of rehearsals, it wouldn’t be possible. For the smaller, more intimate scenes with two characters, I would try to run it at least once in the month before shooting, because I think it’s important for people to have a sense of what [the scene] is about, and then hopefully forget that, so they can pick it up again but still make it seem fresh. Scenes with four characters were simply unrehearsable because the only time you get all the actors in the same room was for the shoot, and you couldn’t do it twice. Most of it happened on set; you try to work through things and occasionally you get snagged. Sometimes you have to stop and one of the actors might say, “I’m not sure what’s wrong, I hope maybe you guys do.” Sometimes you get through a day and you don’t feel like you ever figured it out. And then you just move on and hope you can figure it out in the editing room. Usually, you can. When you decide, “I have an idea for a film I want to shoot”, what form is the story in at that point? The first step was saying to Kate, saying to Justin, “Hey, I’m thinking of doing a film that I’ve decided I want you to play a lead part in. Are you even game to consider that?” And if they say yes, then I go away and write it, which is a lot of time and work. It’s kind of scary because you don’t know what’s going to happen. Obviously, you learn as you go and things change, but we keep fairly close to at least the structure of the screenplay. Scene for scene, the film is a lot like the script. You mentioned in an interview that there was a tonal darkness in Mutual Appreciation that was absent in Funny Ha Ha. Yet there were so many tender interactions. Even the weird, post-concert gathering at Walter’s apartment has a quality of sweetness to it, and then the film ends on this incredibly intimate group action. So what is the darkness you were feeling? In a way, I hesitate to talk about it, because I feel that my opinion isn’t any more valid than someone else’s. And one of the things that’s kind of fun about making an observational film like this, telling a story in this fashion, is that it’s always a pleasure for me when I show the film and people come at it from different angles. I’ll get reactions [ranging] from how sweet-natured the film was to “Why are you such a nihilist?”, and I can see the validity in either of those. Both [aspects] are in there, so it just depends on where you’re standing. For me, it was a difficult film to edit because there is a lot of passive-aggression among the characters. To live with that every day is like having a passive-aggressive roommate. Obviously, I have a different perspective on the film for that reason. I can think of any number of scenes where that cloud creeps in a bit. One is when Justin is sitting in his bedroom playing guitar and the phone rings. He doesn’t answer because it’s his dad and he can’t deal with it. The other is a scene where your character, Lawrence, is letting Alan know he’s aware of Ellie’s crush, and Alan’s being really squirrelly. I guess I was just wondering if you had some motivation to take the tone of this film in a different direction. Funny Ha Ha was not as tough for me to deal with, although I think it is a film about a character who’s more overtly sad. Part of it, too, is this gender thing: Mutual is about a man and, for obvious reasons, that feels closer to home. That’s not to say I don’t identify with the Marnie character – I do – but with a little more critical distance. Also, to watch a sad person who’s essentially a good person can be uplifting. Marnie is a lot more straightforward [than Alan], which isn’t to say she must be viewed sympathetically. If someone wants to read Funny Ha Ha as critical of that character, they’re welcome to. In a way the most compelling and enigmatic character in both of those films is the one you play. Certainly there’s an intelligence that distinguishes them from Marnie and Alan. Was that deliberate? I wonder if you felt that Mitchell and Lawrence were close to you, so that you were best suited to play them, or whether you just wanted to act with your friends in these movies? When I wrote the script for Funny Ha Ha, I didn’t necessarily know that I was going to play Mitchell. Because these films are so small, it was largely a matter of resources. One of the fun things about acting is that it gives you an opportunity to caricature yourself: Bill Morrison does it, Justin does it. When the camera is on, people will find [some quality] in themselves and exaggerate it. Certainly, it was fun to do that with Mitchell. Partially, too, I guess there was some notion of, well, I’m asking all of my friends to act in this thing and they’re all a little nervous about what we are doing, so it would be good for me to jump in there with them and show solidarity. I think what I learned was that it’s not really a sign of solidarity. Mitchell is only in scenes with Marnie anyway, so half the people in the movie didn’t even know I was [acting] in it. But, furthermore, the kind of pressure that was on me as an actor was utterly different than the kind of pressure that was on them. For better or worse, I was the only guy there who knew what was going on, and I was still scared to act. But it was not a comparable experience to theirs. With Lawrence in Mutual, that was a role that I did write with myself in mind. Because I wrote the film with Justin in mind, I could kind of plug into the fact that we have a history together, so it works for us to play friends. Also, partially out of vanity, I thought I would try to do something different. When the first rushes started to come in, I thought, “Oh, it’s a lot more similar than I’d expected”, and I learned the limits of my acting range. They’re pretty narrow. But I’m glad I did it. I don’t know if it’s helpful or not, but I do the thing that Woody Allen does, where you don’t show the actors the scenes that they’re not in, and obviously it’s a bit of a cheat to have myself act in it because of course I know everything. It was weird doing the scene where Alan and Ellie fall into bed together; I felt conflicted about it because I thought. “Well, I might be messing up the scene by being here. I’m the guy they’re both betraying, so I shouldn’t be in the room.” For all those reasons, my characters must feel a little different, because I’m in a unique place as an actor. Actually, my favourite scenes in both films are ones that I’m not in. But I really want to do another film in this similar methodological vein and I really look forward to not being in it and seeing how that goes. These films really bear your imprint, in that you assumed writing, directing, editing and acting duties. Did that ever present any conflicts for you or did it simply give you more ability to shape the film the way you wanted? Certainly the latter; I don’t feel conflicted about it. Obviously there’s a kind of megalomania to it, I guess. But what was fun to me was the collaboration aspect, because making films is wildly expensive and incredibly time-consuming, and I’m not a technical person. There are so many technical headaches and it’s not something I deal with great ease. There are a million reasons why life would be easier doing something else. I have friends who are novelists and I envy that. I have friends who are musicians and I really envy that. I don’t have those talents, particularly, but I also feel like, even if I were any good as a prose writer, I don’t think I could stay in my own head that long. To stay locked up in a room with only your own imagination to keep you company sounds very claustrophobic to me. And the great thing about filmmaking – particularly in production – is that you are feeding off the energy of others. Even when I edit the film, I’m responding to all this great work that other people have done. And the best days directing are the days when I’m not doing anything at all, where I’m eating snacks and the actors are doing something great, and the whole crew is nailing everything and I’m just standing around. That’s a great feeling. Fans of your films have aligned you with Cassavetes, Rohmer, Linklater and Jarmusch. How does it feel to have critics make those connections in reference to your work? It’s a little boring at this point [laughs], but all those people you mention are great. Nobody is saying, “His films are as good as …” If the reference point is whatever else is at the multiplexes right now, then I see the connection. If you get a little closer to it, then I feel like I’m none of those people, as different as they are. I’m a distance away. Most obviously, too, Cassavetes has such an effusive temperament. I never met him, but certainly you can see in his films that he’s a big personality. I’m making films from a place – and about a place – that’s much more contained. I’m a huge Cassavetes fan. I’m certainly an admirer of anyone else I’ve ever been compared to, but I still have to go out and make something of my own. You’ve said that you create microdramas, films that are tuned to frequencies not attended to by the mainstream, films that traffic in small conflicts with small consequences. Do you think that’s going to be a guiding principle for you as things move forward or do you see yourself becoming a bigger temperament? As a dramatist, I wouldn’t make any promises either way, but I like to watch films that are playing at that [more concentrated] level. When I actually remember what my films are, or what I’m trying to get at in them, I feel there’s great drama there on those little frequencies and it’s much more interesting to me. There’s really big stuff happening in the world and I agree with those who argue that it’s not a good idea to look away from that, not a good idea to ignore it. That’s true. It doesn’t make this [material] any less relevant to my experience of life on earth and I would hope that it’s relevant to other people’s as well. What did you make of all the notices that branded you the voice of a generation? I don’t think anyone’s said that and actually meant it. There’s nothing you can say; it’s pretty silly. Considering that Funny Ha Ha circulated like cinematic samizdat for a few years before it got the attention it needed to get, what’s different about going out with Mutual Appreciation? The uphill battle was not so steep. With Funny Ha Ha, I didn’t know I was in an uphill battle until it was all over. I thought that after we played our first few festivals; that was a victory and was as far as we were going to go. We kept having these bursts of life and it was something I’d never predicted. So, with Mutual, that came a little quicker and that was good, but it’s still tough out there. We’ll see. We’ve got the same private investor backing us this time and we have yet to make him back his money on Funny Ha Ha, so we really want that money to come back this time. What kinds of schemes did you resort to in order to fund these movies? Do you feel that reviewers of Mutual Appreciation picked up on the things that you wanted them to? What got missed in the response to your work? Sometimes I don’t want to analyse the art that I like, or anything that affects me on an emotional level. I’m a believer in the notion that analysis transforms an experience. Maybe that’s obvious. So anything that’s a critical breakdown of the film is going to get one part, and it’s going to miss one part of what you hope it will mean to someone. I have similar feelings about press releases. Because no synopsis of my films has ever made them sound any good, I always thought it would be cool to get a poet to do it, or someone who would at least try to synthesize it in the spirit in which it was made. You don’t make a film so that someone will write something smart about it. So, what do you hope people will experience when they watch either of your films? I hope it can mean as much to someone else as my favourite films have meant to me. There are films that stick with you forever. I’m not looking to shape anyone’s way of looking at the world, but when the right film hits you at the right moment, it’s a magical thing. I wouldn’t be doing these if I wasn’t a true believer in the power of art. Damon Smith is a New York–based freelance writer and regular contributor to The Boston Globe. His articles have appeared in Time Out New York, Bright Lights Film Journal, The Boston Phoenix and elsewhere.